A man accused of killing his wife Tuesday night aboard a cruise ship off Southeast Alaska was caught trying to drag her body to the balcony of their blood-splattered cabin, according to an FBI criminal complaint. When a witness asked 39-year-old Kenneth Manzanares what happened, he said, "She would not stop laughing at me," according to the complaint signed by FBI special agent Michael Watson and filed in federal court. Manzanares, of Santa Clara, Utah, was arrested Wednesday after the Princess Cruises ship docked in Juneau. He was charged with murder, the U.S. Attorney's Office for the District of Alaska announced Thursday. Manzanares and his wife, 39-year-old Kristy Manzanares, were aboard the Emerald Princess, which departed Seattle on Sunday on a round-trip, seven-day cruise to Alaska. Passengers told CBS News that the couple was on the ship with a large group, including their children. Their former neighbors told CBS the couple was celebrating an anniversary. The cruise ship left Ketchikan around 3 p.m. Tuesday, according to the cruise line. About six hours later, Kristy Manzanares was dead. Princess Cruises released a statement early Wednesday saying a woman had died after a "domestic dispute" on one of its cruise ships around 9 p.m. Tuesday. The complaint filed by the FBI said witnesses entered the Manzanareses' cabin Tuesday night before security arrived and found Kenneth Manzanares with blood covering his hands and clothing. A passenger in a nearby room told CBS that a young girl from the Manzanareses' room ran out, calling for help, saying her parents had been in a fight. One witness told investigators when he walked into the room, he saw a woman lying on the floor covered in blood, the complaint said. The witness said he saw Manzanares trying to move his wife's body to the cabin's balcony overlooking the ocean, according to the complaint. The witness then grabbed the woman's ankles and pulled her back into the cabin, it said. Soon after, security and medical staff entered the cabin. The victim "had a severe head wound and blood was spread throughout the room on multiple surfaces," the complaint said. A security officer handcuffed Manzanares and put him in an adjoining cabin, according to the complaint. Medical personnel pronounced Kristy Manzanares dead around 9:20 p.m.
At 10:13 p.m., an FBI special agent received a phone call from Holland America Group's company security officer, who told him there "had been what appeared to be a homicide onboard the cruise ship Emerald Princess," the complaint said. At the time of Kristy Manzanares' death, the ship was roughly 7 miles from Forrester Island, which is about 50 miles south of Craig and just north of the Canadian border. The ship canceled a scenic cruise and went straight to Juneau, docking hours ahead of schedule at 7:55 a.m. Wednesday. It was met by FBI agents and local authorities, said the cruise line. The complaint said that when the FBI searched Kenneth Manzanares for physical evidence, "he spontaneously stated, 'My life is over.' "
Since the death happened in U.S. territorial waters, the case was put in federal hands, said the U.S. Attorney's Office. Manzanares made his first appearance in federal court Thursday afternoon. In the Anchorage courtroom, U.S. Magistrate Judge Kevin McCoy read Manzanares his rights and appointed him a public defender. Manzanares, with a bushy beard and wearing an orange jumpsuit, appeared by video conference from Juneau. He answered the judge's yes-or-no questions during the brief courtroom appearance, but did not speak otherwise. He occasionally wiped his eyes with a tissue. Assistant U.S. Attorney Jack Schmidt told Manzanares he faces a maximum penalty of life in prison or the death penalty, and a maximum fine of $250,000. Judge McCoy ordered that Manzanares remain in jail until the case is resolved. Investigators released little new information Thursday beyond what was written in the complaint. 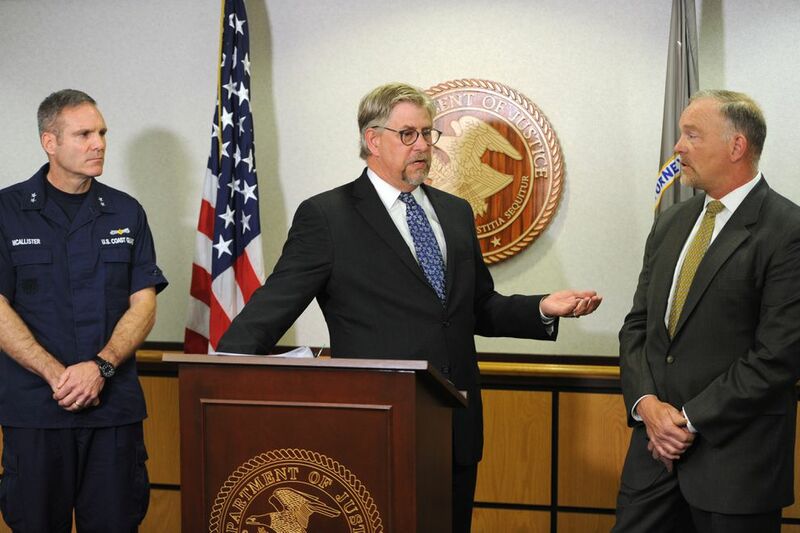 At an 11 a.m. press conference, Bryan Schroder, acting U.S. attorney for Alaska, declined to answer numerous questions from reporters regarding what happened in the Manzanares' cabin, including a motive, who witnessed the crime and whether alcohol or drugs were involved. "Because the case is still being investigated and is still pending indictment by grand jury, we cannot comment on the facts of the case other than those facts in the complaint and the supporting affidavit," he said. Schroder said the investigation was led by the FBI with "close support" from the U.S. Coast Guard and help from local authorities. They completed about 200 interviews with crew members and passengers, said Marlin Ritzman, FBI special agent in charge. The Emerald Princess remained docked in Juneau most of the day Wednesday, departing for Skagway at 11:15 p.m. and "continuing its scheduled cruise," according to a statement from Princess Cruises on Thursday. The cruise line said passengers were refunded for missed shore excursions and each given $150 in onboard credit. Manzanares on Thursday was listed as in custody at the Lemon Creek Correctional Center in Juneau. His next court appearance is scheduled for Aug. 10.